Karina's Kreations: Papaya Collage Again!!! Have you seen the new catty yet? Click on the catalog symbol to check it out!!!! I love it!!! I made this Papaya Collage card as my swap for coffee talk last night. It's a fun set and I love the different images! 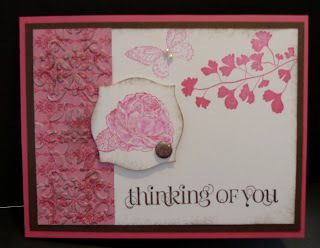 I used Melon Mambo, Early Espresso, Whisper White & Brights Collection Designer Series Paper Stacks for the card stock. The ink colors are Melon Mambo & Early Espresso. I used a Framelits die called Apothecary Accents!!! Put it on your wish list. The greeting is from the Cute & Curly stamp set.